Hanoi (VNA) – Vietnamese localities and China’s Guangxi Zhuang Autonomous Region should enhance exchanges and bolster all-round cooperation, contributing to the sound development of the Vietnam-China friendship, said Politburo member Tran Quoc Vuong, who is also a permanent member of the Party Central Committee’s Secretariat. 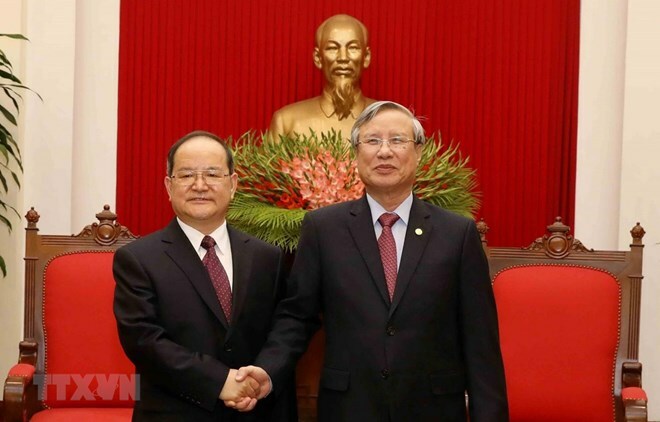 Hosting a reception for Secretary of the Party Committee of Zhuang Autonomous Region Lu Xinshe on March 19, Vuong hailed the robust collaboration between the Chinese region and Vietnamese border localities over the past time. He expressed his hope that Lu’s visit to Vietnam will help promote mutual understanding and further cooperation to develop the comprehensive strategic partnership between Vietnam and China in a more stable manner in the coming time. Lu, for his part, congratulated Vietnam on its socio-economic achievements in recent years, and believed that under the leadership of the Communist Party of Vietnam (CPV) Central Committee, the Vietnamese people will successfully realise the goals set by the 12th CPV Central Committee. He stressed that Guangxi party committee and administration always treasure the friendship and comprehensive cooperation with Vietnam. As there is huge room for both sides to boost collaboration, they should promote transport infrastructure connection and facilitate customs clearance in the coming time, the official added. Guangxi will continue expanding the list of Vietnamese agricultural imports, he said. Furthermore, both sides will promote experience sharing in party building, anti-corruption and human resources training as well as join hands to combat cross-border crimes.